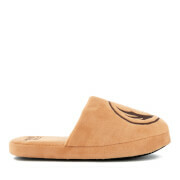 Men's velour slippers from Dunlop. Crafted with soft textile uppers, the 'Duncan' slippers feature elasticated side gussets for comfort, and contrast binding to the topline. Complete with subtle branding and a durable rubber sole. Textile lining. Upper and Lining: Textile. Sole: Rubber.